This fall, Buick will expand the Cascada’s color palette by adding more options based on customer feedback and advanced color trending analysis. Building on a proven color strategy, Buick will add three new exterior colors and two new convertible tops and expand the Sport Touring Dark Effects Package with two additional exterior colors, enhancing customers’ ability to express their personal style on the road. Buick’s three new jewel-toned exterior colors — Rioja Red Metallic, Dark Moon Blue Metallic and Carrageen Metallic — align with customer preferences and color trends showing up globally in other industries, including interior design and fashion. “Color is back,” says Catherine Black, lead designer of Buick’s Color and Trim Studio. “While 80 percent of the exterior colors purchased globally are neutrals — black, silver or grey — many customers are starting to move away from these neutral tones and have an appetite for entirely different colors like dark navy and maroon.” In a segment with limited options, Cascada combines luxury features and additional on-trend color options at an attainable price to give style-conscious buyers more reasons to reconsider Buick. The coordination of Cascada’s newest color palette with larger global color trends is the result of an ongoing advanced color and trim trend analysis from Buick’s Design Color and Trim Studio. Looking at multiple industries, Buick Color and Trim creative designers research, analyze, design and develop interior and exterior colors and materials three to four years in advance of a vehicle debut. “Our Color and Trim designers possess a specialized skill set and acumen for knowing which trends have lasting power and interpreting them for automotive so the choices remain fresh, modern and relevant,” says Sharon Gauci, global director, Buick Design Color and Trim. A number of the colors in the updated Buick Cascada color palette appear in the Fall 2017 PANTONE Fashion Color Report, validating the Buick design team’s work. New color options have also expanded to the Cascada’s convertible top. Sweet Mocha and Malbec are the two new available convertible top options on the Premium trim, joining Ebony. Carrageen Metallic will be offered exclusively on the Cascada’s Sport Touring model. Summit White and Ebony Twilight Metallic join Sport Red as available exterior colors on Sport Touring with Dark Effects package. In addition to more color options, standard 20-inch twin-spoke black-painted wheels are now standard on the 2018 Sport Touring model and navigation is included on all 2018 Cascada models. 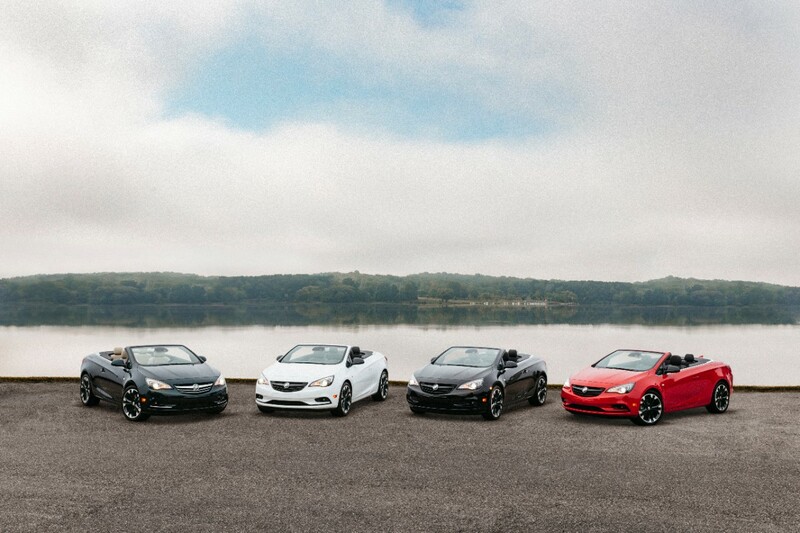 Since launch, the Buick Cascada has outsold the BMW 2 Series convertible as well as Audi’s A3 and A5 convertibles combined. It attracts almost 7 out of 10 buyers from outside Buick and other GM brands. Since launch, fleet sales account for less than one percent of total Cascada sales.